*If you prefer, you can see a .pdf version here (1.61 Mb). Hello from Japan. During the heat of August, life in Japan seems to slow down a bit. This is a nice break for everyone, and this has been true for us this summer as well. However, with the coming of fall, the rhythm of life returns to its typical Japanese pace. Before things get too crazy, we want to give you an update on what the Lord is doing. Earlier today, the news reported that the unemployment rate in Japan has reached an all-time high. Unfortunately, SIBC has not been immune to the affects of the current economic situation. Specifically, the current global crisis has taken it's toll on church attendance. Some foreigners have had to leave Japan because of lack of work, while others (both foreigners and Japanese) have had to re-locate to other parts of Japan. Others in the church have lost their jobs, and have been forced to take jobs that make them work on Sundays. Still others are having to work lots of overtime, which often includes Sunday mornings. As a result, in the last 9 months, Sunday attendance has almost dropped in half. While attendance figures are not important in themselves, this current situation presents us (the church) with two unique challenges. First, we are concerned about those who are unable to attend on Sunday mornings. 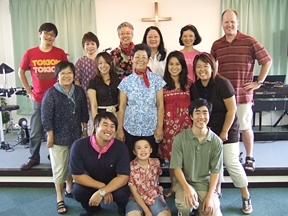 Apart from Sundays, many Christians in Japan have very little Christian fellowship during the week, as busy work schedules often prevent attendance at mid-week gathering as well. However, the reality of the Christian life is that it is NOT about a meeting (on Sunday or any day), but about a relationship with Jesus. Please pray for wisdom on how we (the church) can support and encourage those who are unable to join us on Sundays. May the Lord give us fresh ideas to help all of us walk in daily fellowship with Jesus. The second challenge is to re-think how we "do church" on Sunday mornings. Although our church is small (about 25 adults each week), because we are a bilingual church, it takes a surprising number of people to cover the various areas of ministry on any given Sunday. But the decrease in people means that the few who remain are having to serve more and more in order to maintain our Sunday morning program. While we greatly appreciate their willingness to serve, we don't want people to get burned out or to feel as if they are being used by the church. For this reason, our desire is to simplify our worship service so that Sunday morning is not (as one Christian put it) "another day of work" for those who serve, but a time of rest, encouragement and spiritual refreshment for all who attend. Rather than create extra work for those who are serving hard, we want Sundays to be a time for people to bring their burdens to Jesus and reconnect with Him as the Lover of their soul. To this end, please pray for new and creative ways to gather together on Sunday mornings. May all that we do lead people into a genuine encounter with Jesus. In these challenging times, this is what we need the most. On a related note, the low worship service attendance seems to have put a damper on the enthusiasm and energy of the church itself. Therefore, please also pray that we would not be discouraged, but that the Lord would give us hearts of joy, love and passion that transcends our current circumstance. Despite the decline in numbers, we have had a good summer at SIBC. We had a couple of guest speakers in July and a visit from a short-term mission team from Cerritos Baptist Church (Los Angeles). The team was a great encouragement to the church as they shared their lives with us through worship, a children's message, testimony and line dancing (this last item was a big hit!). We thank them for taking the time to come and minister to us. 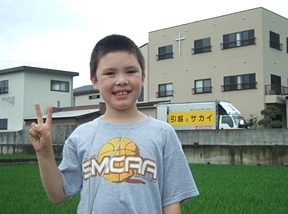 The fall also means a new school year at Kansai Christian School. Luke will be starting the 3rd grade in September and Michael will again be serving as the school chaplain. The big news for the school is that after almost 40 years of renting their facility, they have recently purchased their own property! This is a huge step in the history of the school and we are grateful to God for opening this door. Work is now in progress to renovate the old building into a school before the start of the school year, but the process is being slowed down by lack of funds. Please pray that the Lord would supply all of the monies necessary to create a school environment that will foster academic, social and spiritual growth in the student. Please also pray for Michael as he has opportunity to speak at the monthly all-school chapel times. His first chapel will be October 2. On a more personal note, many of you have been asking about Michael's mother. In late June she had a stem cell transplant in order to treat her multiple myeloma (which is the cancer of the stem cells in the bone marrow). The transplant went well, and she was released from the hospital after about two weeks. The recovery from the effects of the chemo (and the killing of her entire immune system) has been a slower process, but she is recovering well. Although the whole ordeal was pretty terrible, it was not nearly as bad as it could have been. For this we give thanks to God. We also want to thank many of you who have been praying for her. If all goes well, she hopes to return to work (part-time) in mid September. Please continue to pray for increased energy and physical strength. Well, that is about it for this time. Thank you again for all of your prayers and support for us. 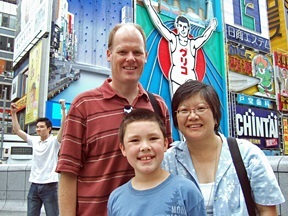 It is a privilege to partner with you as we serve the Lord in Japan.